March 17, 2018 at 12:09a.m. 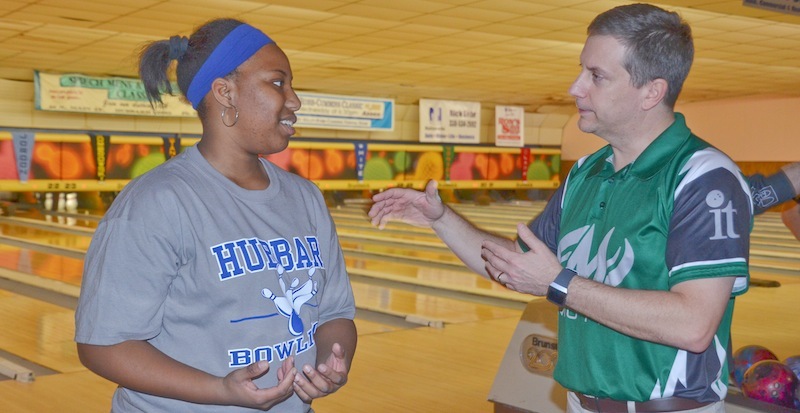 Scott Williams | Hubbard High School senior Alexis Cobbin listens to advice from pro bowler Steve Haas from Enola, Pa., on Friday at Bell-Wick Bowl in Hubbard. Students received instructions from the pros before a pro-am event. Members of the Professional Bowlers Association held a clinic for high school bowlers at Bell Wick Bowling Alley on Friday, March 16, 2018. Photos by Scott Williams - The Vindicator. Friday evening’s party-like atmosphere at Bell-Wick Bowl was an unlikely prelude to today’s more somber and serious day of qualifying for 120 entries in the PBA Hubbard Open. “It’s better than just the sound of balls rolling and pins crashing,” Scott Killian said of the blaring music of DJ Jim Cibella during the high school pro-am that started at 5:30 p.m. before the adult-junior pro-am followed. The regional tournament is being held for an eighth consecutive year, with St. Patrick’s Day always a backdrop. Area high school bowlers were at the opening focus as 23 four-person teams flooded the lanes. For the first hour, teens received instruction from a pro bowler before they took part in six Baker games with the assistance of a different pro for each of the games. Hubbard freshman Isaac Powell playfully worked the crowd and added levity to the alleys as he pranced around in the mascot costume. “I get a lot of joy out of the crowd and the people around me,” said Powell, brother of Adria Powell, the District 1 player-of-the-year in Division II in volleyball last fall. Austintown Fitch senior Seth Welch was in the Hubbard Open’s high school pro-am for a second time, so he knew what to expect from the pros. “They’re all very nice, so you build a pretty good relationship,” Welch said of his experience in March 2017. “Their tips helped me out for my senior year,” Welch said of his 2017-18 season with Fitch, whose boys and girls teams finished 14th and 15th, respectively, at the state tournament in Columbus. Welch’s teammates on Friday were freshmen Dane Smith and Larry Iagulli and junior Samantha Learn. Fitch’s varsity won the All-American Conference Red Tier championship under coaches Matt Clemons and Brian Umstead. Evan Muller and Dawn Smith, the Hickory High-Sharpsville bowling club team’s coaches, accompanied enough bowlers to field 2½ teams, including some from Sharpsville and Commodore Perry. “It’s not a letter sport yet,” said Muller, a USBC level-entry certified coach. Hickory’s home alley is 24-lane Tenpin Lanes in Hermitage, Pa. Among those with the teens were Matthew O’Grady, the Hubbard Open’s only repeat champion; and Ryan Ciminelli, the Hubbard Open’s inaugural winner in 2011. Also participating were touring pros Matt Sanders, Ryan Shafer and Chris Loschetter. Another previous Hubbard Open champion on hand at Bell-Wick was Kelly Jordon. Commodore Perry won the boys tournament (1,075), Boardman won the mixed event (1,057) and Lowellville-McDonald won the girls competition (935). Of the 120 entries, 90 are PBA members and 30 are amateurs. After a $5,000 fee to the PBA, proceeds from the Hubbard Open, presented by the Trumbull County Tourism Bureau, are used to fund the Hubbard High bowling program. Sponsors include P.I. & I. Motor Express, Fagan Sanitary Supply, Golden Corral, Our Gang’s Lounge, Michael Thomas Entertainment, Eagle Wear and Ron’s Sign Shop. March 17, 2018 11:46 p.m.